When friendships are suspended and no quarter given a subsequent bloodbath usually happens. 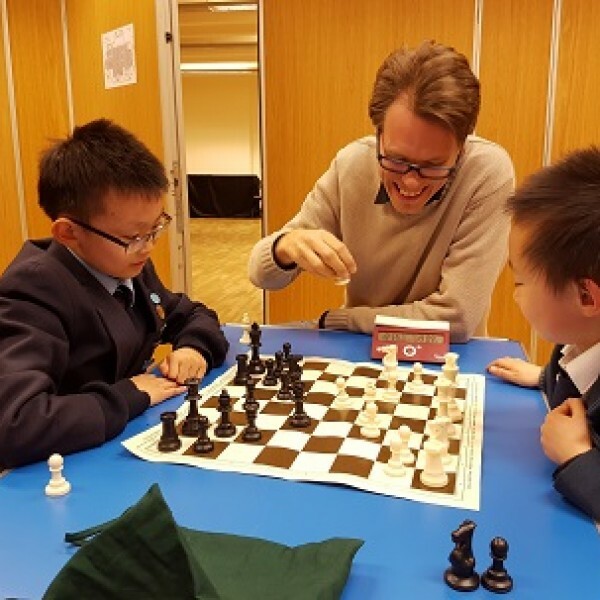 The match exemplified all that is best about London League Chess. The end result a narrow 6-4 loss for your Hammer colleagues, however forensic examination of the individual games shows that Hammer should have won despite an average 14- point grading deficit per board. As in all sport it is the fine margins that count. Bajrush as usual had a totally original position with his c4, d3 and e4 set-up. A positional sacrifice of queen for rook and minor piece and a slight positional edge did not work. When the Black Queen penetrated his position things went quickly downhill. A tough loss. Paul on board 2 had a slight edge in a complex position but not enough to bring home the full point his resolute play deserved. The last game to finish, hostilities were ceased after 10pm and a draw agreed. John Goodacre had a won game after strong and logical play. Material up, he was cruising to a well-deserved victory. He should have won. In his own words “Won game – was plus 4 – I basically got sloppy and messed up”. This quote has been heavily censored for the website. Caissa can be cruel is the moral of the story here – John deserved better. Sheikh on board 4 played the black side of a Grunfeld for the first time and may possibly never play a better one. Extremely double-edged his opponent opted for simplification to secure the draw. On board 6 Safi had a heavy manoeuvring/closed positional game that resulted in a draw – with each side cancelling out the other’s threats. Brian took on Pavel – a former potential Hammer club member. Due to job requirements Pavel had to move to Tooting and hence joining Battersea was the logical move. To the game – Brian although out-graded by 24 points played a good game and secured the draw. On board eight John Woolley had a drawn position and even held the advantage in an endgame with Bishop vs Knight. Unfortunately, a blunder led to the loss of Bishop and the loss of a point. John was cross with himself and hopefully set the record straight next time. On board 10 Robin, although heavily out-graded and receiving a very late call-up, produced his usual fighting chess. He really went for it and created a very unbalanced position. An environment he thrives in. Sadly, fortune did not smile on him and a loss was the result. Am very grateful for him stepping up at such late notice. The star of the evening was Matteo on board nine. Matteo has a very smooth style and beautifully outplayed his opponent both strategically and tactically. The sight of four pawns marching up the board with an accompanying rook on the 7th rank against a bishop, rook and King trapped on the 8th was brilliant to see. Finally, your captain won in a very complex tactical battle where use of the Leicester City Chess rules worked perfectly. Forty minutes up on the clock and an original position on the board translated into my first win of the season. Great to get the first win after two losses and a draw so far. I would like to congratulate all my team and they all exemplified the best traditions of Hammer Chess. The win is coming and keep holding the faith. John White, Hammer 1 Captain LL Division 3. Author HammerPosted on October 21, 2016 October 21, 2016 Categories Club Updates, GamesLeave a comment on London League 4 – Hammer March On!